This presentation will take you through ITIL best practices & several practical approaches to Continual Service Improvement. Improving what we do while we are doing it is not an easy task. The ability to develop innovative ideas & solutions for the business is what leads to higher value perceived. Too often, the business leads IT by requesting improvements, rather than IT leading the business by suggesting improvements. It’s a catch 22. If the IT organization is good at Continual Service Improvement, the results will yield more time for innovation & value to the business customer. Learn how to establish consistent, good practices for ongoing identification, & implementation of improvements that will gain increased perception of IT value, & free up resources to innovate & improve business services. 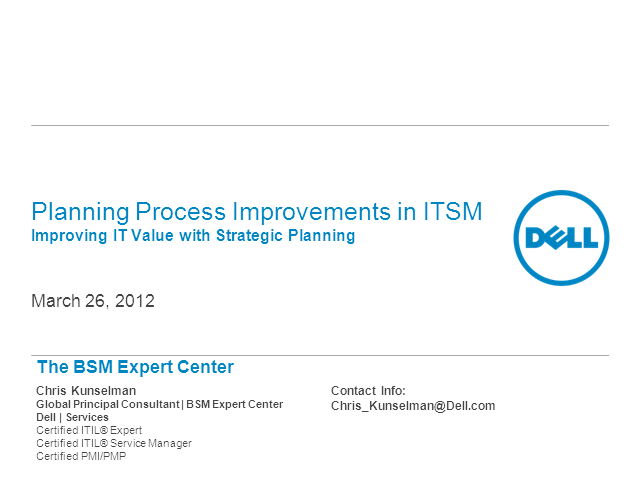 Mr. Kunselman is a Global Principal Consultant in Dell Services’ Business Service Management Expert Center where we help clients optimize their efficiencies, costs & IT service management capabilities. His passion is in helping large organizations improve IT/business alignment, effective IT service delivery, & enable cloud computing initiatives. Areas of experience include: project management, team leadership & mentoring, management consulting, business analysis, system requirements & design, implementation. Mr. Kunselman has been implementing ITIL best practices since 2001 & is especially skilled in the areas of organizational strategy & transformation for gaining effective adoption of ITIL best practices.